I'll send friend requests to all of you once I'm on my Wii U again. Edited by grahamf, 09 May 2014 - 04:51 PM. I don't have a Wii U yet but God willing I'll get one soon. I'm pretty sure you can connect it to a 3DS ID too so that'll likely be my ID. Edited by Gimbal, 09 May 2014 - 06:10 PM. Mario Bros. Mario Kart, etc. Mines evil_rabbid feel free to send a request. Lookin forward to racing with you guys. Edited by DonRSD, 17 May 2014 - 08:13 PM. 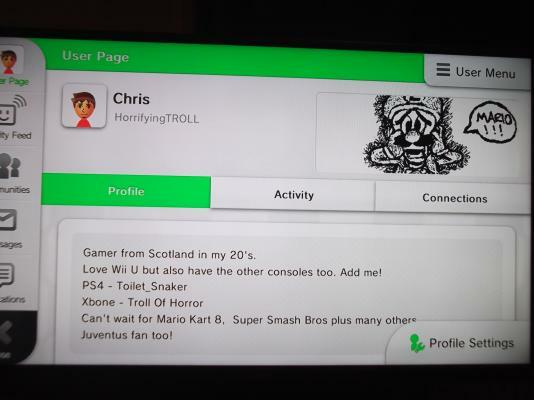 Thought it would be a good idea to upload the user profile page as online MK8 your Mii and nickname is visible so people from here might recongnize you more, plus your NNID is below. Edited by StarfoxFire, 05 June 2014 - 07:34 AM. Edited by EskobarM92, 05 June 2014 - 09:54 AM. Do you have another ID as well? Think I have you added as another. yes, i have a 2nd wii u, so add this one too!